Traditional and new songs for Christmas, Solstice and Yule from Jennifer Cutting's OCEAN (including Lisa Moscatiello and Zan McLeod), with top Celtic, Renaissance, Folk and Rock musicians, including Annie Haslam, Roberts & Barrand, and Sue Richards. 5. Quelle est cette odeur agréable? Award-winning songwriter, multi-instrumentalist, and producer/director Jennifer Cutting and her global orchestra OCEAN return with a garland of songs both ancient and modern for Solstice and Yule. Cutting’s chief contribution is her 6 new original songs illuminating different aspects of the holiday season: the transition from fall to winter (“Fall, Leaves, Fall”), the solar turning point of the Winter Solstice (“Song of Solstice”), the gifts of diverse spiritual traditions (“Light the Winter’s Dark”), nature’s cycle of death and rebirth (“Green Man”), longing for the return of light and warmth (“Summer Will Come ‘Round Again”), and a lighthearted take on the commercialization of the season (“Bah, Humbug!”). Added to these are the peaceful, meditative carols “In the Bleak Midwinter,” “Quelle est cette odeur agréable?” and “Voici la Noel”; the sprightly “People, Look East;” Celtic classics such as “Christmas Day in the Morning” and Balloo, Lammy;” and Cutting’s brooding, dramatic re-visioning of the old broadside “Time to Remember the Poor.” Soaring female vocals and ethereal Celtic harp balance rugged male voices and earthy accordion. Fiddle, whistle, and Highland bagpipes keep it grounded in tradition, while majestic organ, recorder quartet, and strings lend Renaissance elegance. Electric guitars, shimmering electronics, and a rock-solid rhythm section add a present-day dimension. 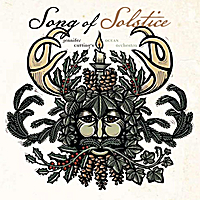 This Solstice album belongs to all generations and spiritual traditions. Cutting’s previous CD, Ocean: Songs for the Night Sea Journey, won “Best Album,” “Songwriter of the Year,” and “Musician of the Year” from the Washington Area Music Association (WAMA), and four stars in MOJO, the leading British music magazine.